Everyone knows the elementary school version of the first Thanksgiving: English Pilgrims and people of the Wampanog nation sat down together for a feast celebrating their friendship. Of course, once we grew up, we found out it wasn’t that simple at all. Because of the holiday’s problematic origins, some American Indian families don’t celebrate. On Alcatraz Island in San Francisco, many American Indian people gather for the Indigenous Peoples Thanksgiving Sunrise Gathering to commemorate the ongoing fight for indigenous rights, by remembering American Indian activists’ takeover of Alcatraz in the 1960s. Even many non-Native people find ways to celebrate that reframe the holiday to give it a more personal meaning. But many American Indian families, like my Mvskoke one, do gather at Thanksgiving for a huge meal to celebrate the good things and people in our lives. We eat our tribal foods every day, but we also include them in the Thanksgiving meal alongside the usual foods like turkey and dressing. It’s one way we reclaim the holiday. And our native foods, in general, are one way we reclaim and reassert our survival as indigenous people. Food sovereignty — the right to grow, make, and eat culturally-appropriate foods — is an important component of the indigenous rights movement, but native foods aren’t just for indigenous people. Last month, The Sioux Chef’s Indigenous Kitchen cookbook was published to help more people, Native and non-Native, learn to cook indigenous foods. The Sioux Chef is a team of chefs, ethnobotanists, and other food activists from several American Indian nations. The organization was founded by Oglala Sioux chef Sean Sherman, and in addition to publishing the cookbook, they cater indigenous foods for events in the Minneapolis/St. Paul area, where they are headquartered. The Sioux Chef is perhaps the most visible organization working to increase awareness of indigenous foods, but there are many indigenous food activists, scholars, gardeners, and cooks across the country. Cherokee scholar Jaquetta Shade is a doctoral student at Michigan State University whose work focuses on the intersection of rhetoric and food within indigenous communities. We spoke with her about her work and why indigenous food is important to everyone. HelloGiggles (HG): Tell us about your work in food sovereignty and how you became interested in it. Jaquetta Shade (JS): As a scholar in the field of Rhetoric and Composition, I am primarily interested in how we make meaning through our relationships with food; however, as a Native researcher, I am interested in how these relationships can be sustainable, respectful, responsible, and centered on culture and community. How I became interested in food sovereignty is sort of a long story: During my PhD coursework, I took a rhetoric course taught by my mentor and dissertation chair, Professor Malea Powell, which included a unit on North American Indigenous rhetorics, during which we studied land and material production. The class met late in the evening, and we regularly brought food and shared dinner while we talked about our course materials. The combination of food with the discussion of material production guided me toward studying the rhetorical practices of cooking and gathering foods. This, coupled with my background as a Cherokee citizen, led me to consider food rhetorics within a cultural framework. At Michigan State University, where I am finishing up my program, there are some folks who are doing important work in the area of food security, food sustainability, and food sovereignty, including Professor Kyle Whyte. While I was beginning to consider food rhetorics in relation to Native culture, I fortuitously attended a series of talks on Indigenous food sovereignty hosted by Professor Whyte, which helped to shape my understanding of the connections between Native peoples, food, and the land, and to see how my research in the everyday, embodied, rhetorical practices of cooking and gathering Native foods can be part of the conversations happening within the Indigenous food sovereignty movement. HG: What is the role native foods play in your family or community? JS: I think that scholar and activist Winona LaDuke says it best in her TED Talk, “Seeds of Our Ancestors”: “Food, for us, comes from our relatives. Food has culture. It has histories. It has stories. It has relationships.” I would add that Native foods help to shape our identities as Native peoples. In my own family, one of our most prized food traditions is wishi (hen-of-the-woods mushrooms). It grows in the fall, and is one of the staples of our holiday feasts. Every year, my father and uncles, and my grandparents before them, go out and gather wishi from the woods. For us, I think that wishi is more important than the turkey. For us, it is a food that teaches us who we are as Cherokee people and as a family. HG: Thanksgiving is a complicated holiday for Native people. How might native foods figure into the reclaiming of the holiday? JS: Thanksgiving is certainly a tricky holiday in Indian Country. Some Native families refuse to celebrate the holiday, but for many of us, Thanksgiving is an opportunity to gather together and eat (and I’ve yet to meet any Indians who don’t like to do that). I’m glad that more resources are available now that disrupt the problematic narrative that depicts happy Indians sharing their bounty with their grateful Pilgrim neighbors. Just as we work to decolonize the Thanksgiving narrative, we can use Native foods to decolonize our Thanksgiving feasts. Lately, there has been a resurgence in Native cooking, with several recent cookbooks, including The Sioux Chef’s Indigenous Kitchen, Heid Erdrich’s Original Local, Andrew George’s Modern Native Feasts and A Feast for All Seasons, to name a few of my favorites. These cookbooks are rich resources for cooking Native foods both in the home and in community spaces. Many of us get caught up in our little traditions over the holiday, particularly around food, but what if, instead, we reclaim Native traditions? What might it look like if we switched out all, or even just one or two, of our conventional Thanksgiving recipes for Native recipes? Maybe it could help us to rewrite the story of Thanksgiving and to reconcile what it means for us in the present-day. HG: Why should non-Natives try indigenous foods, not just at Thanksgiving, but in general? JS: I think that non-Native people might be surprised by how many Indigenous foods they already eat. Corn is pretty much in everything, now, right? All joking aside, non-Native people are likely familiar with many Native foods. 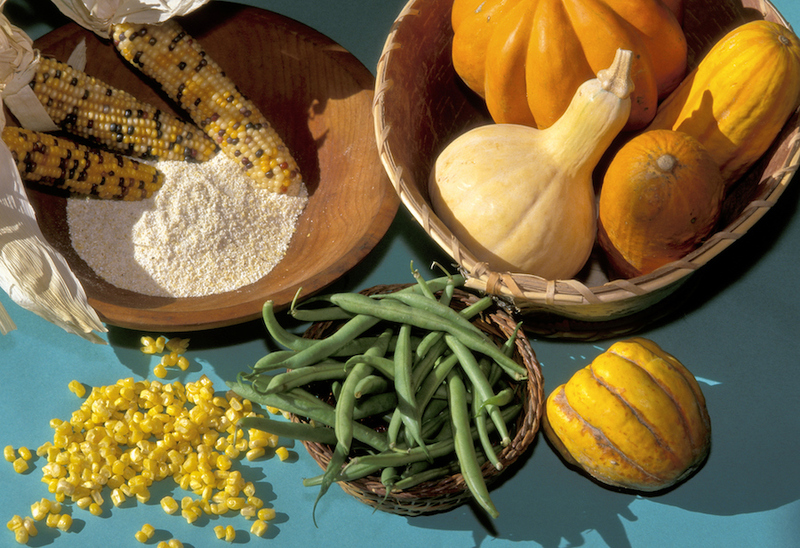 The Three Sisters (corn, squash, and beans), for instance, are fairly common foods, at least in the Americas. When I began my research, I remember my surprise in finding at least a few Indigenous ingredients in nearly everything (looking at you, Pumpkin Spice Latte). Perhaps less familiar are Native methods of cultivating, gathering, and cooking these foods. For example, most Americans are familiar with wild rice, which is typically machine-harvested, but fewer are familiar with manoomin, the Anishinaabe word for wild rice that is hand-harvested using specific tools and cultural protocols. It is the care that goes into manoomin that makes it different than commercially-grown and harvested wild rice. Another example of this difference is maple syrup. For the last few years, I have helped a couple of Native communities in Michigan to collect sap from maple trees and process it into maple syrup, using both contemporary and traditional methods. I may be biased, but the hand-harvested syrup, made with care and love, has much more depth of flavor than the commercially-processed maple syrup. To be fair, however, many of our Native foods end up looking much different than those to which non-Native folks are accustomed. And some of those foods are certainly acquired tastes. Still, my advice is to give Native cuisine a try. You might even find a new favorite food.